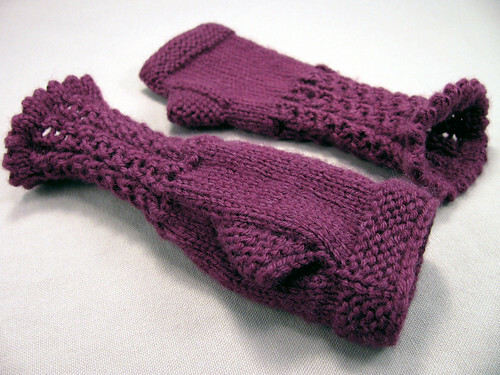 These fingerless mittens were knit using Lion Brand’s Wool-ease yarn that I just happened to have in my stash. One of the ladies in our crochet group made a pair and I liked them so much. The pattern is from an old issue of Knit1 magazine. I just took notes on the pattern, including a very simple 4 stitch lace for the cuff. The pattern was written for knitting flat on two needles and had way too many stitches for my smaller hands. So I figured out a personal version knit in the round on 4 needles. The only problem was doing garter stitch in the round which I solved by knitting a seam stitch above the thumb shaping. I used the tubular cast on method with yarn-overs for the picot edge. The pattern had the cast on edge whipped stitched down which doesn’t stretch as much. Even though I like the longer cuffs, I think a shorter cuff is more practical. This entry was posted on Friday, December 12th, 2008 at 3:00 am and is filed under Knitting and Lace. Tagged: Knitting, Lace. You can feed this entry. You can leave a response, or trackback from your own site.